As of May 2013, work in science, technology, engineering, and math (STEM) accounted for more than 16 million jobs, representing 13 percent of all employment in the United States,according to the Bureau of Labor Statistics. The average annual wage for STEM jobs was $79,640, 1.7 times the national average of $46,440. Demand for STEM jobs is growing faster than employers can fill positions, with 277,000 job vacancies every year despite 271,000 STEM bachelor’s degrees awarded a year, and an estimated 2.8 million unfilled positions by 2018,according to Georgetown University data. Increasing the number of STEM students has become a national priority. One way to achieve this is by cultivating student interest in science and technology at a young age. Fortunately, technology doesn’t have to be too complicated to interest young students. Here are a few examples of simple inventions that changed the world. Educators can use these to convey the importance of science and technology to students. Today, wheels are all around us, from car tires to bikes to volume control dials, so it’s easy to take them for granted. But for thousands of years, wheels did not exist. As Smithsonian editor Megan Gambino explains, wheels do not occur naturally in nature. The first known wheel did not appear on the historical record until about 3,500 B.C., when the people of ancient Mesopotamia, southern Russia and Central Europe used them for pottery. Within a few hundred years, people had figured out how to use wheels for chariots, introducing the world to wheeled vehicles. The ancient Greeks developed wheelbarrows to save labor sometime between the sixth and fourth centuries B.C. During the Middle Ages, wheels were abandoned for transportation in the Middle East in favor of camels, while spoked wheels continued to be used in Europe. Spoked wheels remained the norm until the 19th century, when the combination of wired wheels and pneumatic tires revolutionized transportation, first with the bicycle and then with the automobile. These are just a few examples of how the wheel has transformed society. Others include spinning wheels, astrolabes and propellers. Educators can use the wheel to introduce students to such basic scientific principles as rotational motion. Another simple round invention that has revolutionized society is the o-ring. Inventors such as Thomas Edison experimented with early circular rubber seals, but it wasn’t until 1936 that Danish-American inventor Niels Christensen invented the modern o-ring while designing brakes for cars. The o-ring provides leak-proof connections and seals. Christensen demonstrated to the U.S. government how his invention could be used with planes, and within a few years, o-rings became invaluable to the United States and the Allies during World War II for use with Air Force hydraulic systems. After the war, o-ring applications became common in automobile manufacturing, industrial hydraulics and farm equipment manufacturing, to name a few. Today leading o-ring manufacturer Apple Rubber makes over 8,000 different sizes of specialized o-rings for such uses as aircraft engines, automotive fuel handling and chemical processing. Educators can use the o-ring to teach such principles as how a vacuum works. The invention of duct tape was preceded by pioneering uses of duck cloth and adhesive tape. But it wasn’t until World War II that ordnance factory worker Vera Stoudt invented what became today’s duct tape. Worried that ammunition boxes weren’t secured tightly enough against moisture, Stoudt hit upon the idea of sealing the boxes with cloth-based, waterproof tape instead of the thin paper tape previously in use. Stoudt sent her idea to President Roosevelt, and the War Production board approved it and assigned Johnson & Johnson to develop the tape. Military personnel soon discovered the tape was useful for fixing everything from guns to aircrafts. The post-war housing industry began using duct tape to connect heating and air conditioning duct work together. 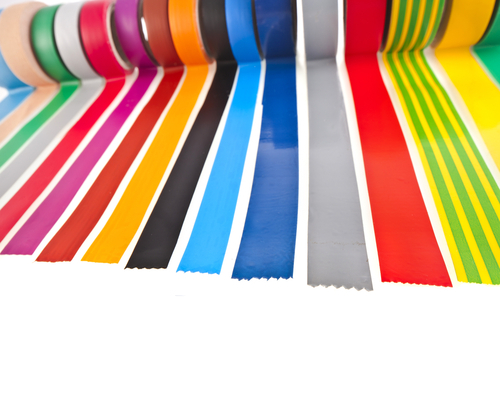 Today duct tape continues to be used in heating, air conditioning and ventilation while lending itself to a variety of other household, commercial and military uses. Educators can use duct tape to illustrate the principles of adhesion and show students that anyone can become an inventor with a little problem-solving ingenuity.